A new release doesn’t always have to bring incredible features, as it can silently set the stage for bigger things to come. 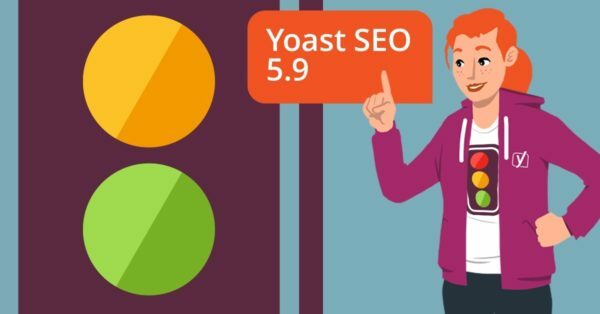 Yoast SEO 5.9, released today, is such a release. 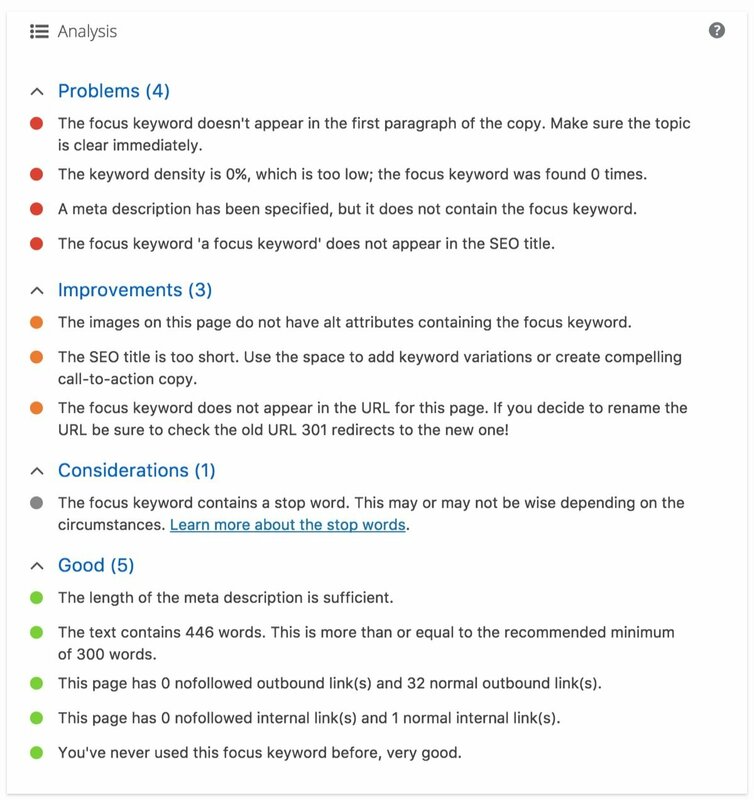 While this release doesn’t contain groundbreaking new features, it does provide an important new piece of the Yoast SEO puzzle for the future: we’ve rebuilt the content analysis in React. While the content analyses itself haven’t changed, the way we present the results has changed in Yoast SEO 5.9. To improve the user experience and accessibility of the results, we’ve decided to group these into several groups: Good, Considerations, Needs improvements and Problems. These follow roughly the colors of the bullets from green to red. This allows you to focus on your most important SEO issues first. By grouping the results this way, colorblind users, for instance, can easily discern the difference between the results. Also, every header is collapsible. You can get the green bullets out of the way to focus on the red ones. Thanks to this new grouping of the results you get a more structured overview of the SEO of the piece you’re working on. Before, it was one big list that became more cluttered with every added check. Now, we’ve added a new focus to the analysis, making it easier to use. You’ll fix your SEO in no time! Besides fixing a load of bugs in Yoast SEO 5.9, we’ve also added several enhancements that make the plugin easier to use. We’re also adding a new focus on our onboarding wizard that has helped so many first-time users set up their Yoast SEO install in record time. We’re now showing a notice nudging users to open the onboarding wizard when the plugin is installed for the first time. We’ve also made the ‘Next’ and ‘Back’ buttons in the onboarding wizard focusable, to improve accessibility. We’ve also introduced the wpseo_add_opengraph_additional_images filter so you can add additional OpenGraph Images with a lower priority. The order in which you place OpenGraph images determines which one Facebook shows, which is usually the first one. This led to issues with WooCommerce SEO as their Gallery images always appeared on top. With the new filter, you can add additional images to the OpenGraph image list. These should not be shown as the default image, but you could use these for more advanced purposes. Some sites allow you to pick any image found in the list. That’s Yoast SEO 5.9 for you! With this new release, we’re continuing the renewal of our foundation to make sure we can build an awesome new house in the future. We’ve also fixed loads of bugs and enhanced some parts of the plugin to make sure you can do work in the best possible fashion. Happy updating! From last few days i can’t use Yoast SEO plugin and i face problem in 5.9.3 version. I’m not able to set focus keyword, can’t set SEO score and readability. Please tell me why this is happening? I notice that the new Yoast SEO 5.9 isn’t compatible with WordPress 4.7.8. I continue to use that version because there are many other plugins that don’t support newer version of WordPress. Why do you not continue to develop update for WordPress 4.7.8? Thank so much for the update. But i don’t see the change about increase the length of meta description. In the next update, Edwin? I too, wonder about the new increased length for meta descriptions. Hi, how can I redirect the correlations with the plugin? Why do I no longer see a count of how many outgoing and incoming links for each page/post? Google officially increases length of snippets in search results from 160 characters to almost 230 characters on average. I hope Yoast will has new update for this changing ! Hi Danielle. Google seems to automatically generate these longer snippets and we have not yet seen instances where our own longer descriptions show up in the results. We are actively investigating this and will update Yoast SEO when we have an answer to this. This sounds like a sensible improvement that directs us to make the right changes for each page or post. The “problems” should always have the highest level of importance, so that’s great. Yeah, it makes much more sense like this, doesn’t it? Thanks, Peter. 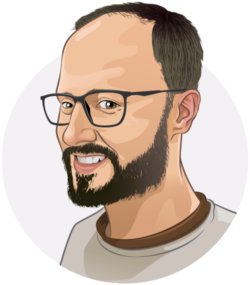 Hey, Thank you so much for updating Yoast, It is the best plugin in the world. Thanks for the update! But why have you not taken into account that google allows since two weeks longer descriptions? The plugin seems not to be updated in that regard. It still shows a limit of 156 characters while google allows 3-4 lines (!) as description. To be fast right know to update the descriptions is essential in terms of SEO, isn´t it? Hi Thomas. Google seems to automatically generate these longer snippets and we have not yet seen instances where our own longer descriptions show up in the results. We are actively investigating this and will update Yoast SEO when we have an answer to this. Looking forward to updating today! Thanks for the detials.